The first publication of the Hickory Dickory Dock lyrics dates back to London in 1744. Any original meaning and purpose has apparently been lost over the years. It has been long thought to be a type of counting rhyme. 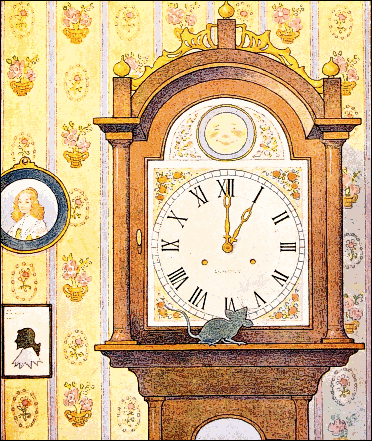 Today it is considered a nonsensical rhyme with words that mimic the sounds a clock makes. 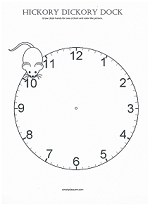 This makes it a fun rhyme to teach when teaching kids to tell time, or regarding being on time. In any case, it is a short rhyme that is fun for kids. 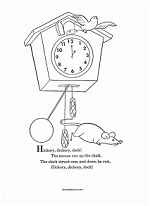 Enjoy a coloring page that includes the rhyme or have the children make clock hands for one o'clock and color the picture. Why teach nursery rhymes? Because language activities help develop listening, expressive and memory skills. Examples of language activities? Listening to stories and poems. Telling and retelling nursery rhymes. Singing and chanting. Discussing meanings of words. Nursery rhymes include all of the above in a fun kid-friendly manner. What could be better?